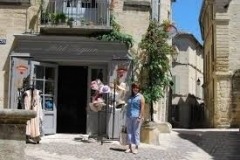 *Once you have selected your room, tours and transfers, please click “Purchase” on the main menu to check-out. 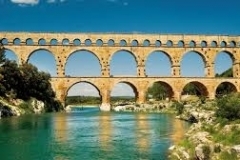 Begin by visiting the Pont du Gard Aqueduct (entrance included), one of the most visited ancient monuments in France. 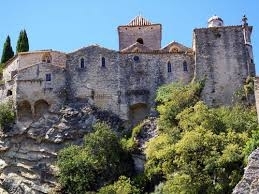 It is listed as a World Heritage Site by Unesco and remains one of humankind’s greatest masterpieces. 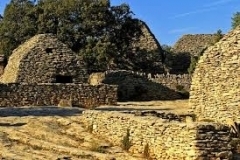 A marvel of antiquity and a true technical feat, it is also a stupendous site that has regained its unspoiled state since its refurbishment. 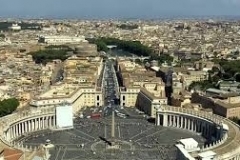 At 48 meters high, it has three vertical rows of arches: 6 on the lowest level, 11 on the second level and 35 on the third and top level. 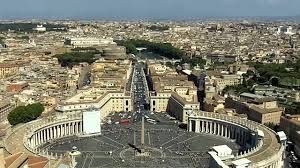 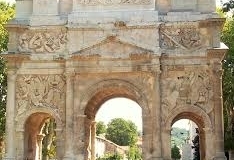 Its upper part reaches a length of 273 meters (originally 360 meters when there were twelve extra arches). 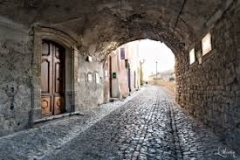 It served as an aqueduct until the 6th century before becoming a tollgate in the Middle Ages and finally a road bridge from the 18th to 20th century. 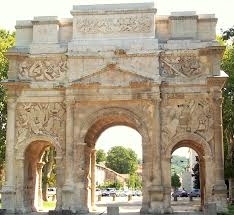 Continue to Nîmes, an important outpost of the Roman Empire. 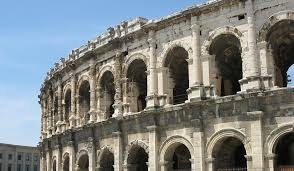 It’s known for its well-preserved Roman monuments such as the Arena of Nîmes, a double-tiered circa-70 A.D. amphitheater still in use for concerts and bullfights. 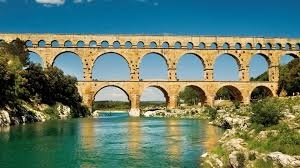 Both the Pont du Gard tri-level aqueduct and the Maison Carrée white limestone Roman temple are around 2,000 years old. 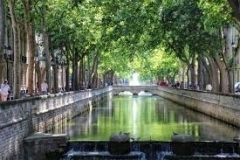 Also visit the Jardin de la Fontaine, a 17th-century park on 15 hectares offering Roman ruins & botanic gardens, plus ponds & sculptures. 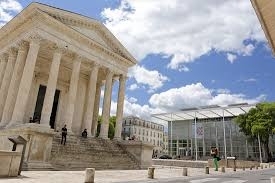 Lunch in Nîmes (not included). 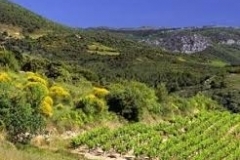 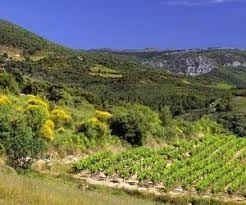 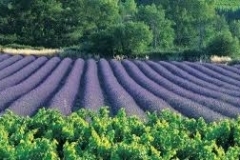 Complete the day with wine tasting in the famous wine region of Châteauneuf-du- Pape followed by a visit to the southern Côtes du Rhône in bloom. 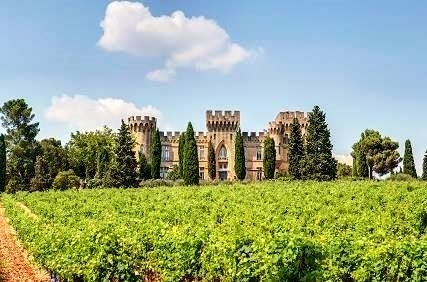 Between the cities of Avignon and Orange, Châteauneuf-du-Pape is set on its hill like an island rising out of a sea of grapevines. 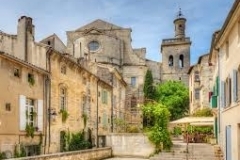 At its summit stand the vestiges – a wall, a tower and the lower hall – of the château built by the popes in 14th century as their summer residence, to let them escape the city heat of Avignon. 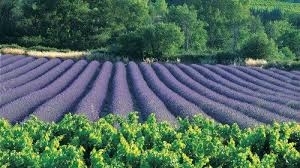 It was, in fact, the popes who planted the town’s first vineyards. 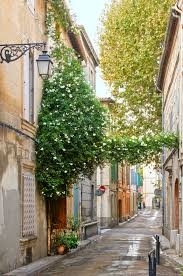 Return to Avignon. Continue with a visit to Saint Paul de Mausole. 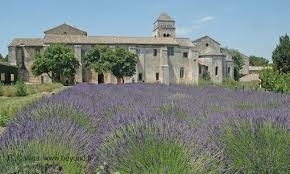 The monastery is best known for the fact that Vincent van Gogh stayed here from May 1889 to May 1890. 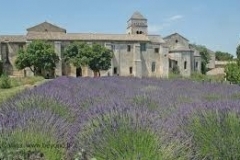 A masterpiece of Provencal Romanesque art, the 11th -12th century cloister backs onto the chapel, in pure Romanesque style, with a façade altered in the 18th century. 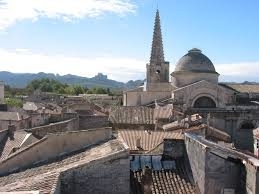 It is capped by a square bell tower in the Lombard style. 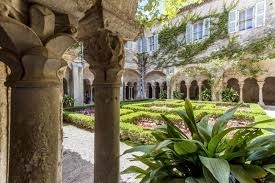 One wing of the pretty Romanesque cloister houses a museum which retraces the period when Vincent van Gogh was committed to Saint-Paul. 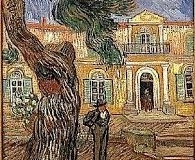 Visit the emotionally-charged reconstruction of the artist’s room and admire more than 20 large-scale reproductions of Van Gogh’s most famous paintings on the site where they were created. While in Saint Remy, view the Arc de Triomphe and the Mausoleum of Jules, two exceptional Roman monuments universally known as the Antiques before continuing to les Baux de Provence for lunch (not included). 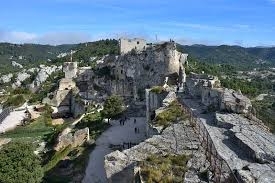 Built on a rocky outcrop, the Citadel of Les Baux de Provence offers incomparable panoramic views over the Alpilles mountain range. 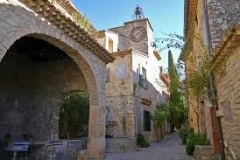 It is a veritable open-air museum with architectural masterpieces at every corner of the cobblestone lanes that criss-cross the old village. 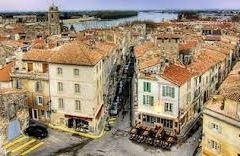 The last stop of the day is in Arles, a World Heritage Site and city on the Rhône River. 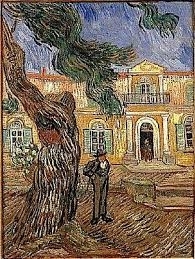 It is famed for inspiring the paintings of Van Gogh, which influenced the contemporary art displayed at the Fondation Vincent Van Gogh. 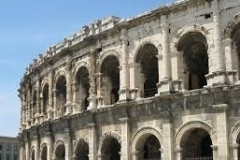 Once a provincial capital of ancient Rome, Arles is also known for many remains from that era, including Arles Amphitheatre (les Arènes d’Arles), now hosting plays, concerts and bullfights. Return to Avignon. 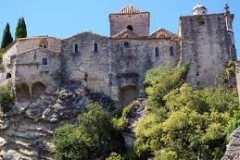 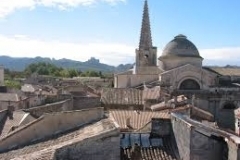 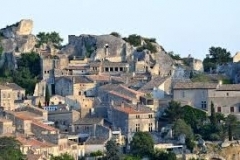 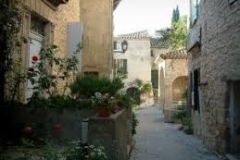 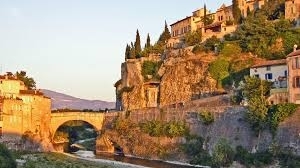 Tour Description: Visit the small village of Fontaine-de-Vaucluse with its mythical source. 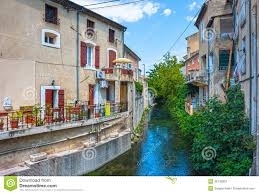 The Sorgue comes from an immense underground network of waters, and has an average flow of 630 million m3 per year, the biggest in France and one of the biggest worldwide. 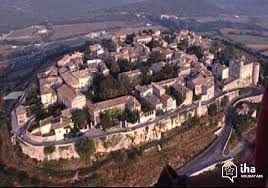 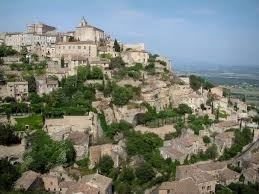 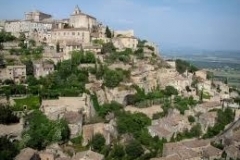 Continue to Gordes, one of the most well-known hilltop villages in the region, and one of the most beautiful in France. Its houses and buildings of white stone root themselves into the sharp cliff of the mountain, its labyrthinth of “calades” (narrow cobblestone streets) do not leave the visitor indifferent to its charms. 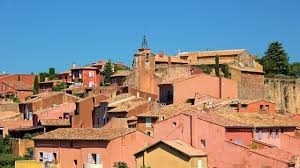 Then travel to Roussillon, named the red city with its ocher cliffs. 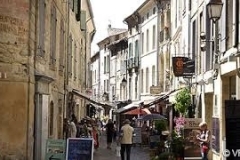 Classified among the “most beautiful villages of France”, this magical town is a maze of picturesque little streets and squares. 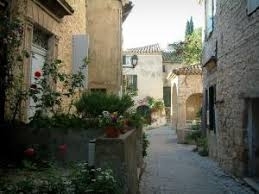 The village is full of simple houses with charming and harmonious façades along its colorful lanes. 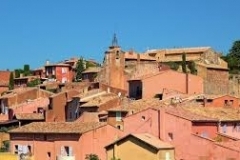 Ochre is everywhere, in the landscape, the building façades, as a trompe l’oeil just around the corner and also in the hearts of the people to whom the pigment provided a livelihood up to the 20th century. 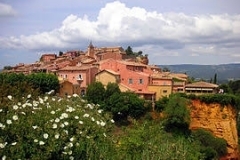 Lunch in Roussillon (not included). 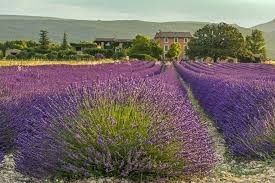 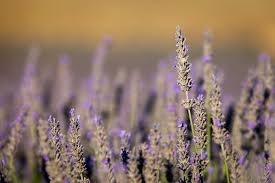 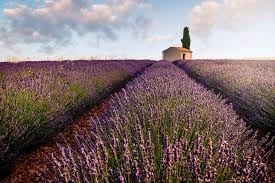 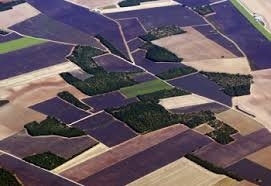 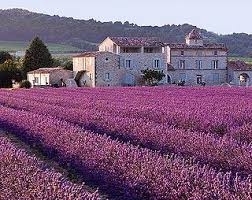 Then stop to see the very first fields of lavender in bloom before returning to Avignon. 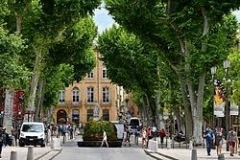 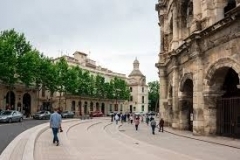 Tour Description: Visit Aix-en-Provence a town surrounded by a countryside full of authentic Provencal houses with traditional French style gardens that date from 123 B.C. 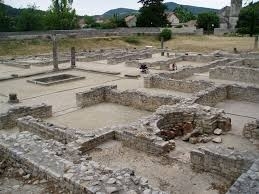 when founded by the Romans. In the 15th century, Aix was the capitol of Provence and and wealthy merchants and dignitaries helped turn this city into the “Florence of Provence”. 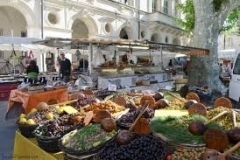 Visit the local sites lunch along the way (not included). 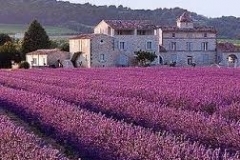 From Aix-en-Provence, travel to Valensole Tray, a small town on a hill to the east of Manosque in the south-west of the Alpes-de-Haute-Provence department. 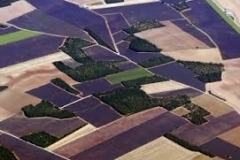 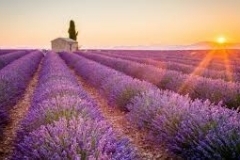 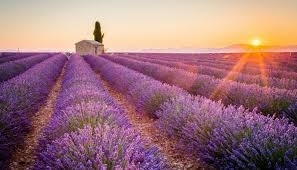 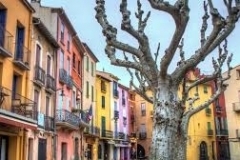 It is a small traditional Provencal town mostly visited for its surrounding countryside and in particular the Valensole plateau, well known for its lavender and its almond and olive tree plantations. 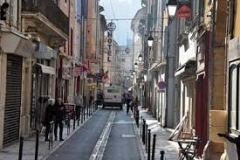 Enjoy the area with serval stops before returning to Avignon. 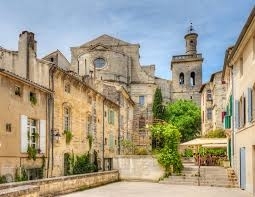 Tour Description: Considered the jewel of Roman Provence, Vaison la Romaine is a city filled with archeology that is surrounded by the River Ouveze. 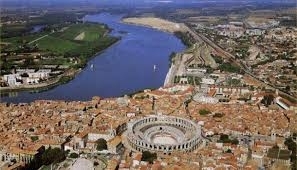 On the right bank are two different quarters; the site of the ancient Roman colony and the modern town. 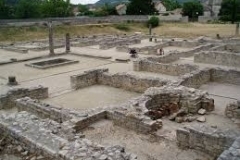 Archeological digs have revealed immense and luxurious Gallo-Roman homes. 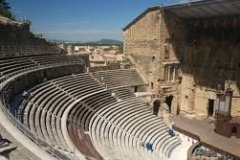 Visit the Roman theatre and view the Medieval town with its spectacular views. Continue to Séguret, located in the northern part of the Vaucluse. 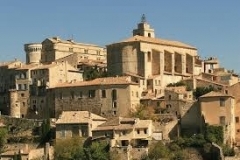 The village lies at the foot of a hill topped by the ruins of its feudal chateau. 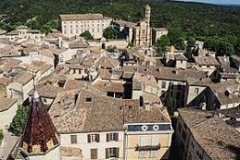 Séguret is one of the official “most beautiful villages in France”, and thoroughly deserves this distinction. The charm of this village is its medieval character. 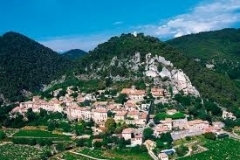 Aside from its amazing setting with historical treasures at each step, the village is also known for its “Cote du Rhone winemaking tradition. 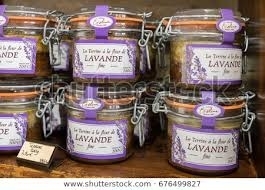 Lunch (not included). 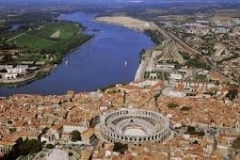 Continue to Orange, the “City of Princes” and home to two UNESCO World Monuments; the Roman Theatre and the Triumphal Arch.The Roman Theatre of Orange is the world’s best preserved ancient theatre. 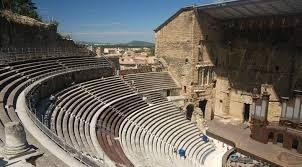 It is the only theatre in Europe to have preserved its stage wall. 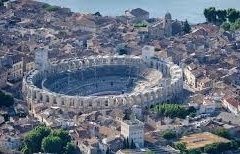 Due to the acoustics and the structure, 9000 spectators could and still can attend performances. Orange is a city full off ancient treasures and also full of life. 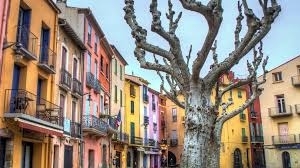 This art of living makes Orange a favorite stop-over for tourists. 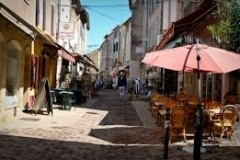 Orange has lovely streets, many little squares, cafés shaded by sycamore trees and many restaurants that cook traditional provencal meals. 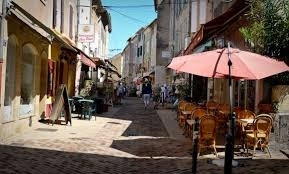 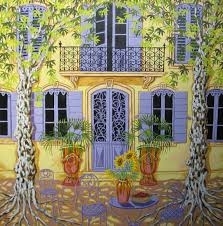 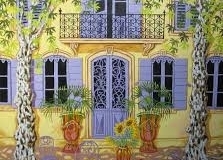 The city of Princes has retained all the charm of a provencal town. Return to Avignon. 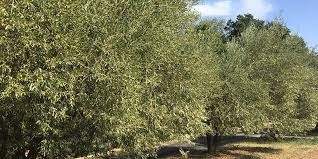 Start the day with a visit to an olive oil mill to discover the “Liquid Gold” that makes olive oil an essential part of the Provencal culture, countryside and kitchen. 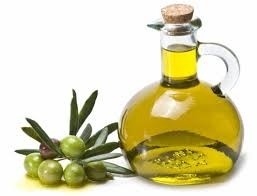 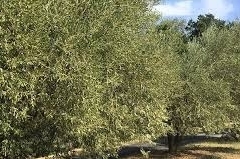 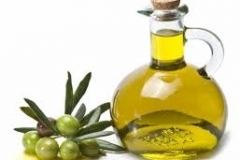 The greeks brought the olive tree to Provence 8,000 years ago and the olive tree now is as present in the landscape as it is in the vineyard.The olives themselves featured in local dishes and local markets display all sorts of different olive varieties cured in different ways. 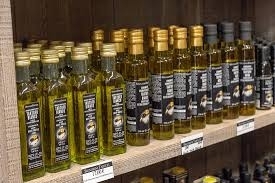 Here, olive oil is taken as seriously as wine. 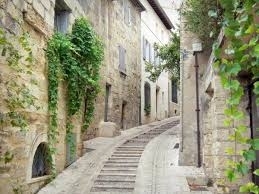 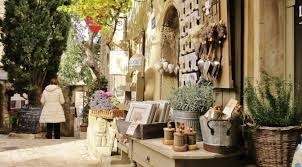 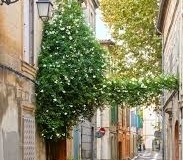 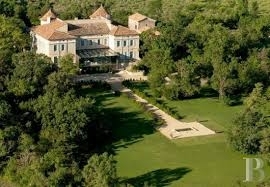 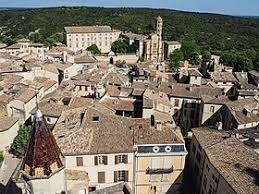 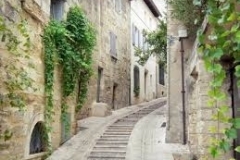 From the olive oil mill, travel to Uzes, a discreet and elegant town that preserves it rich past. Encircled by the Boulevard Gambetta, the Medieval town is a maze of small streets and shaded squares lined with 17th and 18th century private mansions.Under the arcades of the Place aux Herbes and along the neighboring streets a market that takes places every Saturday whose reputation has for a long time stretched beyond the region. 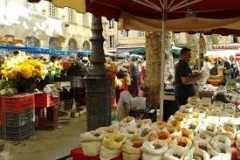 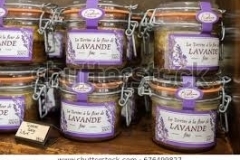 You will find a profusion of regional products, in the warm and colorful atmosphere of Provencal markets. 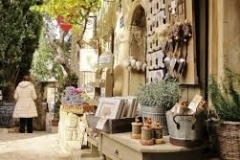 Just steps from the Place aux Herbes, the medieval garden, a little haven of peace, presents 450 varieties of edible and culinary, ornamental and medicinal plants that illustrate their importance in everyday life in the Middle Ages. `return to Avignon in the early afternoon.